(By Mandee Pauch) RANSOMVILLE, N.Y. – Aug 2, 2016 – Stewart Friesen keeps it in the family once again as he captured the Super DIRTcar Series Summer Nationals at Ransomville Speedway Tuesday night for the second year in a row. Friesen’s night started off on a bad note as he damaged his car in time trials and was forced to bring out his back-up car. 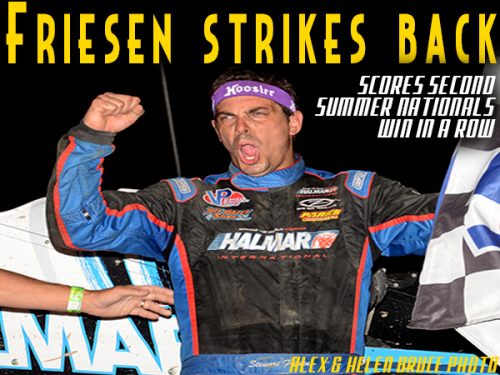 That didn’t stop Friesen and the Halmar team from rebounding to take home the victory. Peter Britten and Brett Hearn started the 30-car field to the initial green. Britten jumped to an early lead as Hearn worked the topside to run him back down. Hearn was working every lane possible to get past Britten. Hearn dove to the outside and was finally able to make the pass for the lead on lap nine. It wasn’t long until Hearn caught the back of the field. As Britten was trying to chase Hearn back down through lapped traffic fifth place starter, Sheppard started knocking on Britten’s doors. Hearn and Britten were running right around the bottom as Sheppard was digging the top line. There was a three car battle brewing for fifth spot between Wight, Billy Decker and Tim Fuller as they ran three wide for several laps until Wight slowed down due to a right rear flat bringing out the second caution of the night. Friesen took advantage of the lap 44 restart as he charged to the outside and drove by Britten and Sheppard for the second spot. Hearn led the way at the halfway mark over Friesen, Britten, Sheppard and Decker. The third restart of the night was on lap 59. Hearn chose the inside line, putting Friesen on the outside. Friesen drove his No. 44F machine as high as he could take it into turns one and two and took the lead from Hearn by the time they entered into turn three. As Friesen took the lead from Hearn, Sheppard then snuck under Hearn to overtake second spot on lap 62. Last place starter, Danny Johnson, who used one of his provisionals to start the main event broke into the top ten by lap 65. Friesen had half a straightaway lead over Sheppard by the time he caught lapped traffic on lap 73. The fourth and final restart of the night was on lap 83. Hearn opened the door on the bottom giving Britten the advantage to sneak through to take third spot. Sheppard was slowly closing in on Friesen as the laps wound down. Friesen moved to the bottom as he caught lapped traffic on lap 95. Sheppard was on Friesen’s bumper as Friesen began to move all over the track through heavy lapped traffic to try and keep Sheppard from passing him. Sheppard worked to run down Friesen as Friesen had his hands full working his way through traffic. Friesen had the advantage on the exit and held on to the top spot over Sheppard by just 0.347 seconds at the line. Following Sheppard was Britten, Brachmann and Hearn as the top five. For Sheppard, the second-place finish wasn’t what he had hoped for. Sheppard believed he had the car to win. Britten rolled onto the front stretch in third after what has been an up and down season for his racing team. Races Notes: 40 cars attempted to qualify and 30 cars started the main event. 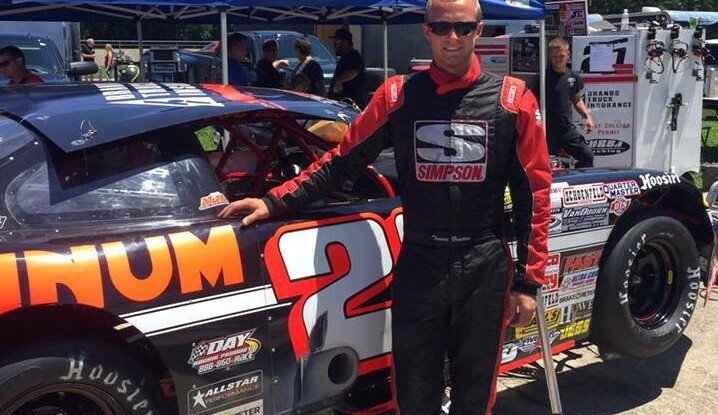 Danny Johnson hit the wall hard in warm-ups and was unable to fix the car in time. Johnson started the back end of the field in Kyle Coffey’s car for the feature. Friesen also hit the wall hard in time trials forcing him to bring out his back-up car. 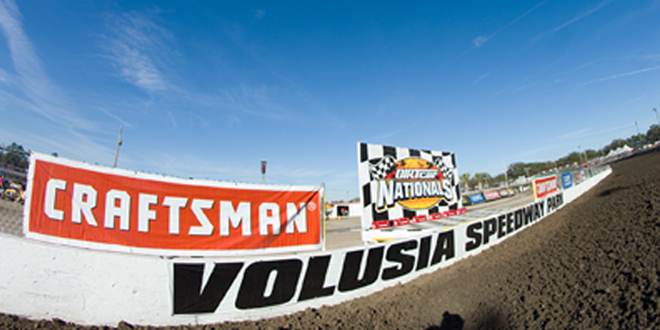 Four cautions were brought out during the 100-lap main event. The Super DIRTcar Series rolls to Weedsport, N.Y. as the series takes on Weedsport Speedway on Tuesday, Aug. 9. 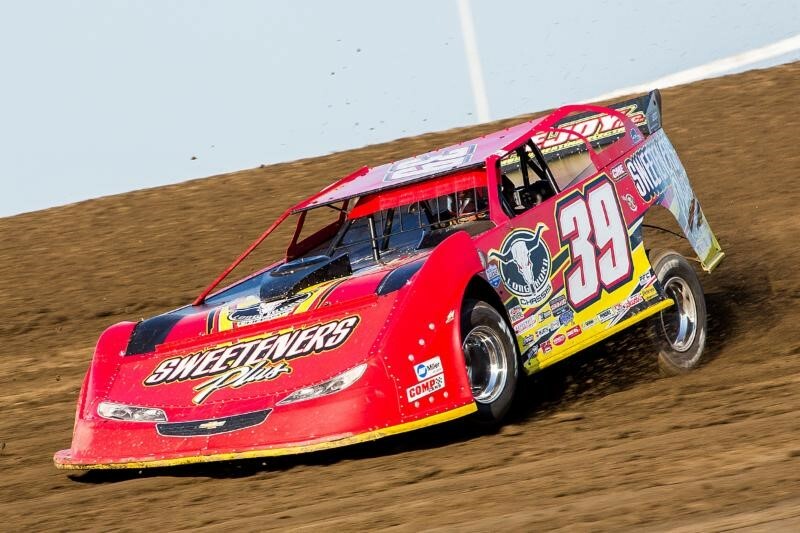 Super DIRTcar Series Statistical Report; Aug. 2, 2016; Ransomville Speedway; Ransomville, N.Y.